These amazing coconut popsicles are made with coconut milk, sugar, and vanilla bean–nothing artificial. Ever. An easy and healthful summer treat. 1. In a small saucepan over medium heat, whisk together the coconut milk, vanilla bean and seeds, sugar, and salt. Cook, stirring occasionally, until the sugar has dissolved and the mixture just barely begins to bubble. Do not boil. Remove the pan from the heat, cover, and let steep for at least 1 hour. 2. Remove the vanilla pod and discard. Whisk the coconut milk mixture to recombine and dump it into a large measuring cup for easy pouring. Fill 6 ice-pop molds with the coconut milk mixture, divvying it up evenly. Freeze until firm, at least 2 hours or up to overnight. These coconut popsicles are DEEEE-li-cious. A great, rich-tasting, satisfying, creamy treat. We made this recipe 3 times in 1 week, the first time with 3 tablespoons regular sugar and the next 2 times with 3 tablespoons coconut sugar. Preparing and mixing the mixture takes only a few minutes. After setting the mixture aside to steep for an hour, we fished out the vanilla bean, cleaned it well with a dry paper towel, and buried it in the sugar bin. We froze the pops overnight. Our popsicle molds are on the big side, so this made 4 pops. I love coconut and vanilla so this popsicles recipe was heaven. I ate 4 in 12 hours. If you don't love coconut or fat, this recipe is not for you. My only recommended change is to use a whole vanilla bean and not half. I absolutely love these coconut popsicles and have already made them 3 times! This recipe was easy, quick, and cheap! I used a can of full-fat coconut milk that I found in the Thai section of the grocery store, only 2 1/2 tablespoons sugar, and 1 vanilla bean. The pops took about 2 hours to freeze fully. I (somehow) resisted the chance to peek at the popsicles in the freezer every 10 minutes. The pops unmolded well—I think the fat of the coconut milk helped. The result was delicious! Creamy and smooth with a definite vanilla flavor. The 2 1/2 tablespoons sugar was plenty because coconut milk already has its own sweetness. These coconut popsicles are a 10. I really have nothing much to add to this recipe. 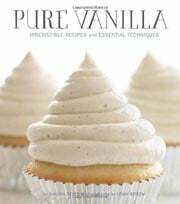 It makes a delicious pop with the perfect balance between coconut and vanilla. I cannot ask for a more satisfying summery dessert that is this simple to make. Well, maybe adding some mango or coconut chunks might gild the lily a bit. I was a bit dubious why we have to use only half the vanilla bean; might as well use the whole thing. However, the finished ice pops were indeed perfect. The whole vanilla bean might've been too much. Vanilla extract might work instead of the beans here (start with no more than 1/2 teaspoon) but you will lose those cool tiny black specks in the finished ice pops. I used 4 tablespoons sugar and that worked great. Just a reminder when tasting the unfrozen mixture is that you want it a touch on the sweet side, as frozen foods taste less strong than the same food at room temperature. So what might seem perfectly sweet warm might end up less so after being frozen. The coconut milk I used is my regular Thai brand that comes in a small carton called Aroy-D. It's delicious and easy to find at Asian grocery stores. These sweet little treats almost made themselves. Steep a vanilla bean in some sweetened coconut milk then freeze. Who knew popsicles could be this easy? My only complaint is that my pop mold only makes 4, and I had some mixture left over. So I stored it in the fridge until we ate the first ones. Not wanting to risk a slushy inside, we waited till the next day before eating. 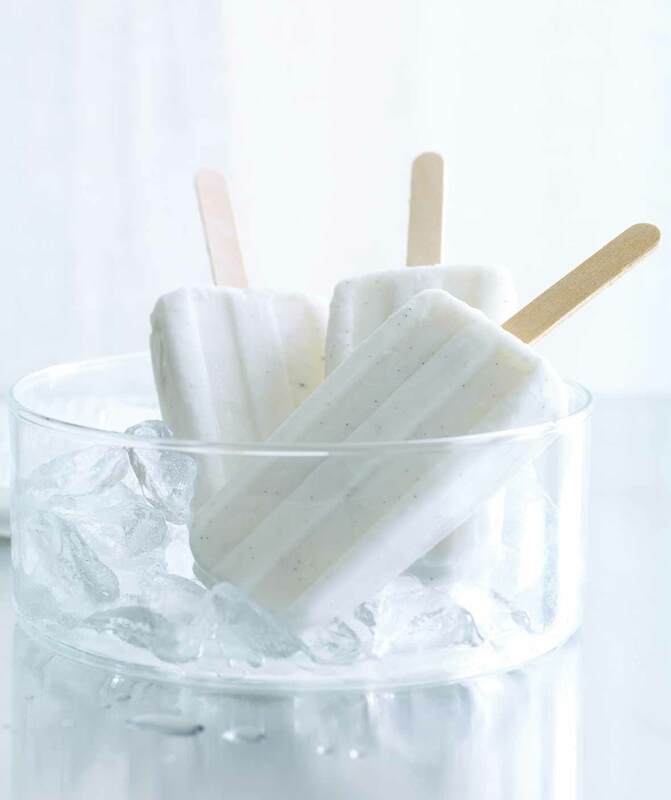 A pleasant surprise: pulling out the frozen pop revealed the tip of the creamy white treat speckled with vanilla seeds. Pretty! It does not get any easier than this to impress your family and friends with a delicious, refreshing treat. This is a great snack for those who avoid dairy but love the flavor and texture of a great fudgesicle. From start to finish, I had these pops done in about 4 hours. It took about 5 minutes to heat the coconut milk with the sugar and vanilla. I let it rest covered for an hour and then allowed it to cool for another hour before pouring the mixture into the molds. During the cooling process the coconut vanilla mixture developed a thin skin on top. A quick whisking of the mixture blended the entire pop mixture together again. It took a little less than 2 hours to freeze solid. The flavor was slightly nutty, rich with vanilla, and not too sweet (I used 3 1/2 tablespoons sugar). If you're looking for a fast and delicious way of making vanilla ice pops, you came to the right place. I never thought that I could do them in so little time and with only 4 ingredients. We made the recipe at night and placed the coconut popsicles in the freezer. They were ready to be eaten in the morning. I only added 3 tablespoons sugar. Truthfully, next time I will add a tad less, as we are not too big on sugary things. The vanilla flavor was stronger than the coconut, which was perfect as my older daughter isn't crazy for coconut (she still liked these a lot). This recipe is so simple and tasty to make that we will be making it often. These pops were creamy and rich. I forgot to buy a vanilla bean, but I really wanted to try these popsicles, so I ended up using 3/4 teaspoon vanilla extract, which gave my ice pops a subtle vanilla flavor that worked well with the coconut milk. And 3 tablespoons sugar seemed ample to us. I got a scant 4 pops from my mixture, which I froze in very cute ladybug-shaped molds. My taster thought they needed an accent flavor like raspberry, but they reminded me of the ice cream parlor flavor sometimes labeled "fresh churn," which was a favorite of mine when I could eat dairy ice cream. This is a worthy lactose-free substitute. Coconut Popsicles Recipe © 2012 Shauna Sever. Photo © 2012 Leigh Beisch. All rights reserved. All recipes and photos used with permission of the publisher.